Your corporation or group can experience the fun, laughter, and intrigue of the Lone Star Murder Mysteries on an exclusive basis. Our scripts allow for customization to fit your corporation, thereby enhancing your employees experience of our performance. 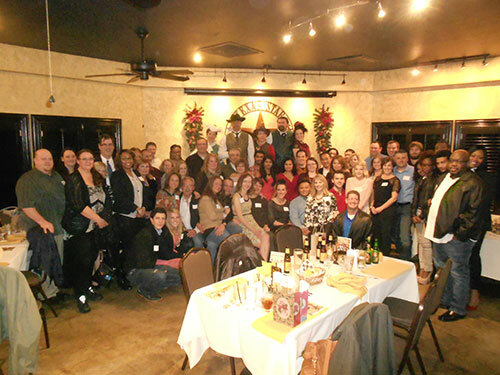 A murder mystery dinner experience is a fun team building exercise as well. And yes! Our show travels to other locations. For a custom private murder mystery quote at the Texas Star Dinner Theater, please call our ticket phone line: 817-310-5588. Want us to bring the show to you? Call our Lagniappe Productions' head office at 817-337-1882 or visit our website. Take a peek here and see how much fun your group party can have. “Plans are already underway for a bigger and better event next year…we look forward to your organization’s participation again. --- T. Wayne, Grapevine Vintage Railroad. “We are still laughing and talking about it…”.